David Byrne’s name comes up a lot when describing Man/Miracle and you can understand why. The Oakland quartet almost seems the graduated equivalent of first wave CBGB, one that combines older, wiser, latter-day permutations with their initial and youthful regard for sound and song. 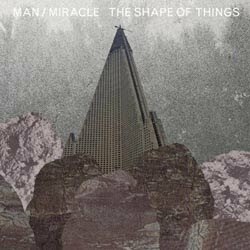 Think Naked era Talking Heads with generous nods to Marquee Moon and Blank Generation and that should amply provide a summary of Man/Miracle’s new album, The Shape Of Things. Singer Dylan Travis’s throat does possess that distinguished blast that Byrne’s known for, but as it’s always considerate to be fair, that’s not such a distraction from the music as one would think. 90s variations on the Byrne/World theme seemed to embrace most of what came to be wrong with post-grunge rock music as Dave Matthews Band, Rusted Root and Phish became cornerstones of reconsidered world-conscious jam music. As if The Dead weren’t bad enough. Man/Miracle is more of a barebones variation, a legitimized progression that remembers its roots. When I hear The Shape Of Things, I hear the way The Dead should’ve been reinvented, or at the very least, what the Talking Heads MAY have sounded like if they’d given it another shot. Strange duality between two very different worlds, but it’s there to be heard. Having said that, Man/Miracle rarely deviate from this Naked/World flavor. “Above The Salon,” “Up,” and “Dayglo” stick too closely to the same tropic-flavored beat construct. Then you hear a song like “Hot Sprawl,” inventive guitar work the likes of Television’s “Venus De Milo” with mid-tempo to hyped-up transitions that confirm the band’s ability to do something else. “Multitudes” lays down some damn-near Jaco Pastorious-inspired bass rhythm with syncopated drum taps and “Other People” takes the good parts of “Marquee Moon” and comes up with a decent and engaging piece of music. So stuck are they on one mode of conveyance that those rare instances of “something different” seem more appealing. If The Shape Of Things can boast any sort of saving grace, it’s that Man/Miracle have raw sensibilities, art rock riffs and an otherwise “Left of the Dial” approach to their music. Even the hippie-commune whiff of “Pushing And Shoving” comes across smart enough to be loud and not content to catch a contact and fade into some unnecessary Dead-ness.